A liquid nanodispenser, called NADIS, was recently developed to answer the need of deposition techniques for nanosciences. 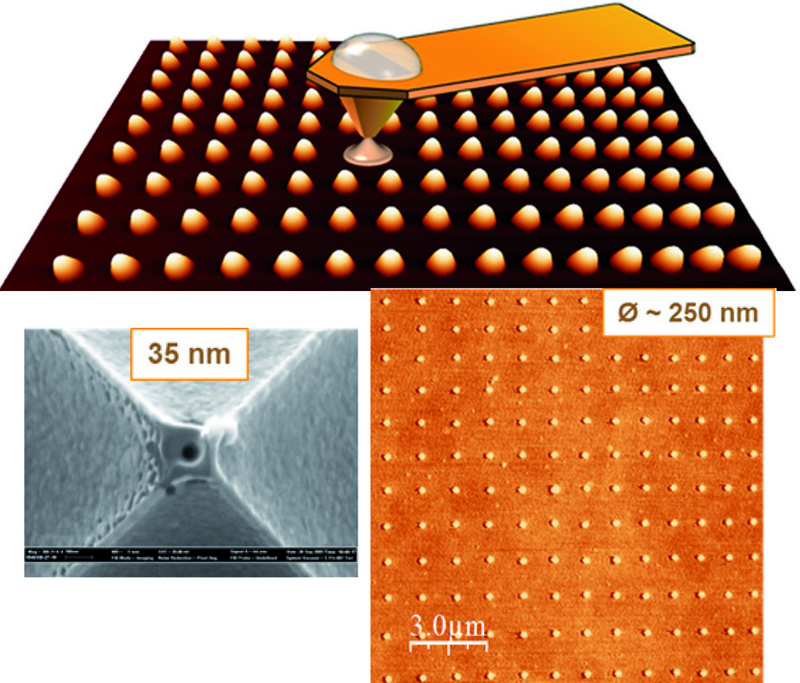 The deposition is realized with an original atomic force microscope (AFM) tip including a nanochannel drilled at its apex by Focused Ion Beam. The liquid transfer is performed by capillarity through this channel during contact of the tip with the substrate. It was shown that, by tuning the tip properties, the size of the deposited patterns can be controlled down to 70 nm in diameter corresponding to volume in the attoliter range (10-18 L). Molecules, nanoparticles or proteins in solution could be patterned with high resolution. In the case of nanoparticles, we assessed the ultimate limit of the method and showed that large arrays of single (or pairs of) nanoparticles can be reproducibly deposited. 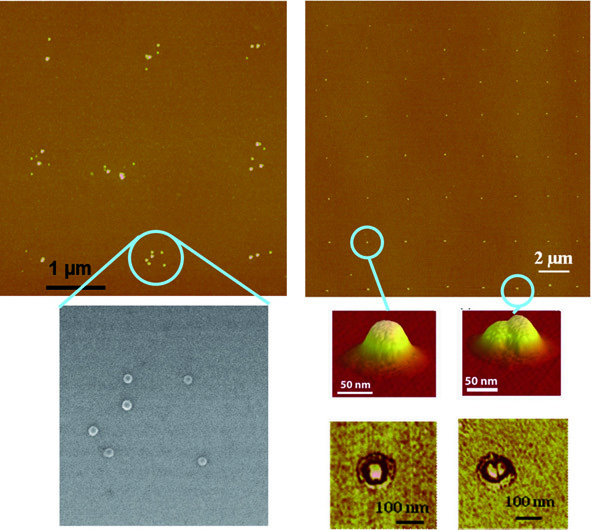 It demonstrates that NADIS can be an alternative to other scanning probe lithography techniques since the versatility of liquid manipulation allows the high resolution direct writing of any soluble molecules or nano-object (nanoparticles or biomolecules). 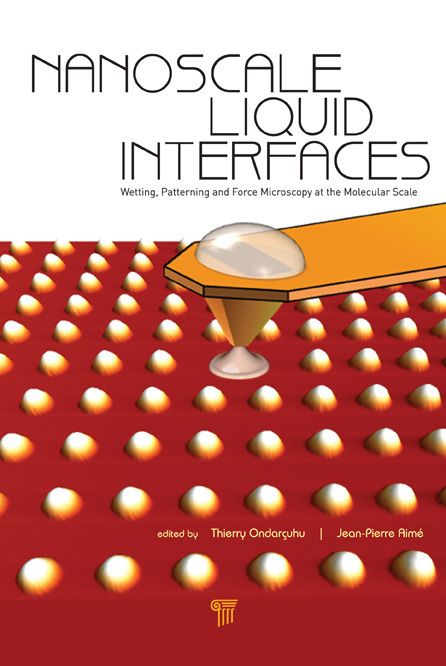 We also demonstrated that, in addition to its interest for surface patterning and molecule deposition, NADIS is a unique tool to probe capillarity and wetting at nanoscale as illustrated by studies of capillary forces, spreading dynamics and evaporation at sub-micron scale. 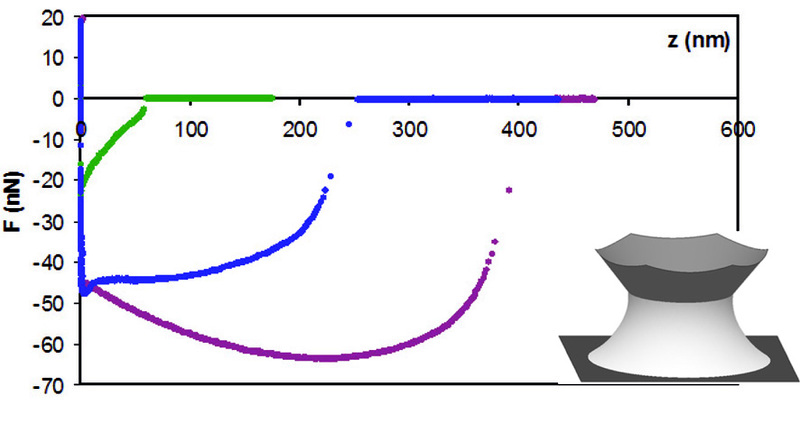 Control of droplet size in liquid nanodispensing, A.Fang, E. Dujardin, T.Ondarçuhu, NanoLett. 6 (2006) 2368-2374. Direct patterning of nanoparticles and biomolecules by liquid nanodispensing, L. Fabié, P. Agostini, M. Stopel, C. Blum, B. Lassagne, V. Subramaniam, T. Ondarçuhu, Nanoscale 7 (2015) 4497-4504. European integrated project "NaPa", Cnano GSO interregion project.